The bus station (éstacion de autobuses) in Granada is at the Carretera de Jaén. 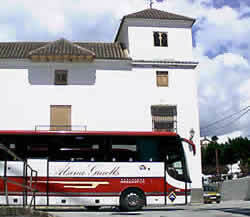 The bus company Alsa - Alsina Graells reaches nearly all the towns and hamlets in the Alpujarras with its comfortable buses. Daily, every two hours buses leave for both destinations. Daily, buses leave every hour to both destinations. Bus number 19 leaves every half an hour from plaza Torrijos. It stops at the central bus station and continues its journey for about twenty minutes to the airport Pablo Picasso. The village of Mairena from the city of Guadix is about fifty kilometres via a mountain pass route and is an one hour drive. From Granada to Guadix is another one hour drive. The city of Almería is an hours drive away. For beach outings Mairena is about thirty five kilometres from the coast. Car rentals have very reasonable tariffs and conditions in Spain. 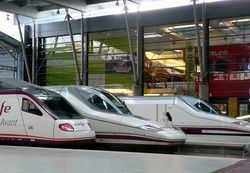 Málaga, Almería and Granada have international services. 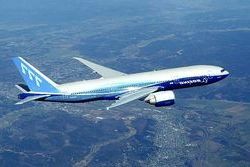 Almería services charter flights, in the summer season there are more frequent flights. Granada is a port for national flights but services also some international charters. Málaga is the largest airport in Andalucía and one of the main international destinations in Spain.